There is perhaps one reel that is more popular, in New Zealand, with anglers after kingfish than any other. It is the Shimano Speedmaster TSM-4. This reel is almost a classic in that it has endured the test of time. It is reassuring to know that plenty of spare parts are available in the unlikely event that you should need them. 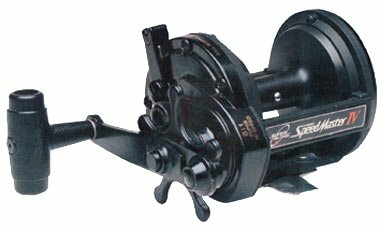 This is a true star drag casting reel with a clutch system that allows the spool to totally disengage from the drag. There is a small knob on the end plate that you can turn to control the cast. This causes a very light drag to be applied to the spool to pre­vent over-runs and their re­sulting bird’s nests! To cast you simply place your thumb on the spool and with your other hand flick back the clutch lever to dis­engage the drag. After cast­ing you flick the clutch lever forward and start winding. It is possible to send your popper or jig a considerable distance with a Shimano Speedmaster TSM-4. I well remember being on a launch in the Marlborough Sounds and making a good cast with the TSM IV that turned out to be a bit longer than anticipated, resulting in a new home-made popper becoming hopeless embedded in native bush some way up a hillside near French Pass ! It would be possible at a pinch to use the Shimano TSM IV as a salmon reel, al­though you would have to take it easy or an overrun could result with the alu­minium spool. For very long distance casting for salmon the spool needs to be very light weight. TSM IV has a retrieve ratio of 6.0:1. This is very fast! It means that if you wind the handle flat-out, your jig or popper fair belts along at a speed of around 8 knots or more. With a full spool you can retrieve 44.5 inches (1.1 meters) of line per crank of the handle. Yellowtail kingfish have a definite preference for live healthy baits. Obviously the fitter and healthier the bait fish the faster it swims and it is in this application that the Shimano TSM IV works to best advantage with jigs and poppers. A rapid retrieve can trigger a strike from these powerful predatory fish where a slower retrieve might simply be ignored. A high gear ratio also makes for better touch when strik­ing the fish because you have less slack line to take up. Very few reels have a gear ratio as high as 6.0:1. Shimano have been building bi­cycle components, gears in particular, for over sixty years, and you can be sure that the gearing is both tough and durable, to­gether with its high speed! The main and pinion gears are made from stainless steel. With its three stainless steel ball bearings the handle spins very smoothly. The Shimano Speedmaster TSM IV can hold 480 yards of 20 lb line and 330 yards of 30 lb. It is a good general purpose boat reel that would be ideal to use fishing for cod and trumpeter around Stewart Island, albacore tuna off Kaikoura, snapper around New Zealand , and of coarse the yellowtail kingfish should they put in an appearance. 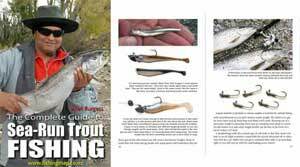 There is also plenty of line capacity to make the reel a good choice to use troll­ing a lure out behind the boat! This is a very stylish looking reel having a one piece black graphite/ titanium frame. It has a solid stainless steel reel foot. This makes the reel super light weight at just 17.6oz. The powerful yellowtail kingfish stopping titanium drag features six big washers. The drag is increased by turning the star clock­wise. It is important to set your reel’s drag adjustment properly. To do this fit the reel onto your rod and thread the line up through the guides and tie the end to a spring balance. With your mate holding the rod with the tip up adjust the star knob until line pulls off at about one third line of line weight. For example; if spooled with 30 lb line it should start to pull off the reel when the spring balance reads 10 lbs. Setting the drag properly is very important because kingfish put up a very powerful fight on their way to the bottom. They try to wrap your line around rocks and so snap it off. A good quality reel is imperative if you are after these monsters. 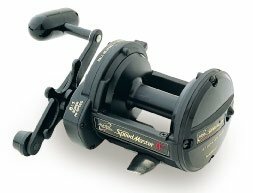 The TSM-3 makes an excellent long distance salmon fishing reel when used in the surf. You still see the odd one down at the river mouth being used for this purpose. So if you need a good solid reliable saltwater reel to take with you on your next charter, club trip, or for general bottom fishing, you can’t go past the TSM IV from Shimano. Line capacity for the TSM-3 is 20/360, 25/290. Gear ratio 6.0:1. Weight 479 grams. Line capacity for the TSM-4 is 20/480, 25/390, 30/330. Gear ratio 6.0:1. Weight 499 grams. Shimano TSM-4 Specs on Shimano NZ website.